I added a new object type for the Drawing module of FreeCAD. It is a clip plane object, it behaves like a group, you can place it inside a page (which happens by default when pressing the button), and add view objects to it by dragging them in the tree view. It has X, Y, Width and Height properties so you can define the viewport precisely, and a "show frame" property which can be used to see a red border around the frame, useful to place it correctly. The clip object then simply clips all the view objects contained in it, without any further transformation. 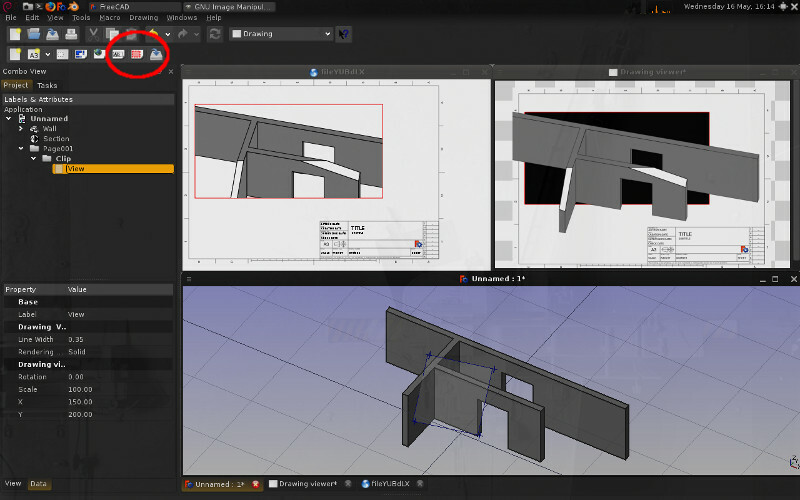 The bottom view shows the 3D view with a wall and a section plane object, the top right window shows the current Qt-based Drawing viewer. Due to the internal limitations of the Qt svg engine, it cannot represent the svg clip object correctly. But the webkit viewer (left image), which will be used by default once we find time to do so, shows it correctly, as well as other svg applications.